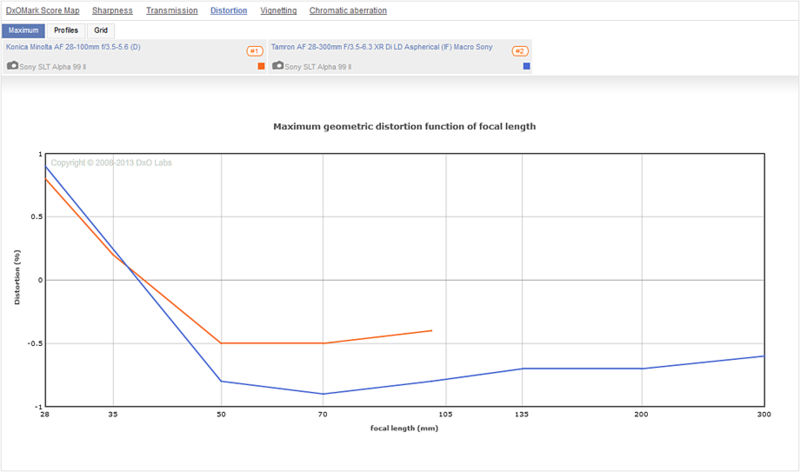 Wide maximum apertures such as f/1.4 or f/1.8 are pretty rare on zoom lenses. The largest maximum aperture on the Sony-mount zoom lenses we’ve tested so far is f/2.8. Such smaller maximum apertures reduce light transmission and therefore affect low-light performance. 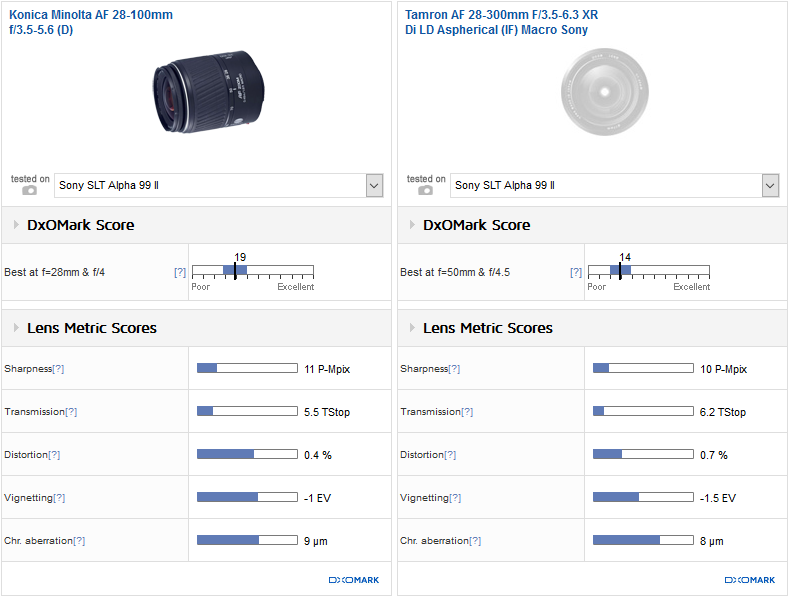 This often results in lower overall scores than we often see on “fast”-aperture prime lenses, but there are still some top-quality zoom lenses available for the Sony A99 II. For top performance, look out for Sony G lenses, which include the Japanese manufacturer’s highest-grade optics, a SSW autofocus motor for quick and quiet focusing, as well as fixed maximum apertures. 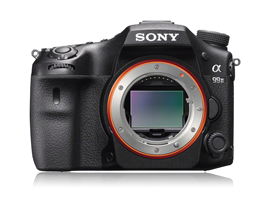 The A99 II’s 5-axis SteadyShot INSIDE image stabilization system eliminates the need for lens-based stabilization in these high-grade Sony G zoom lenses (as well as for most other lenses). Cheaper, smaller, and lighter variable-aperture lenses are also available from Sony, as well as from third-party manufacturers such as Sigma and Tamron, so there are options to suit most A99 II photographers’ budgets. We’ve tested a total of 14 zoom lenses on the Sony A99 II, covering focal lengths from a wide-angle 16mm through to a super-telephoto 500mm. 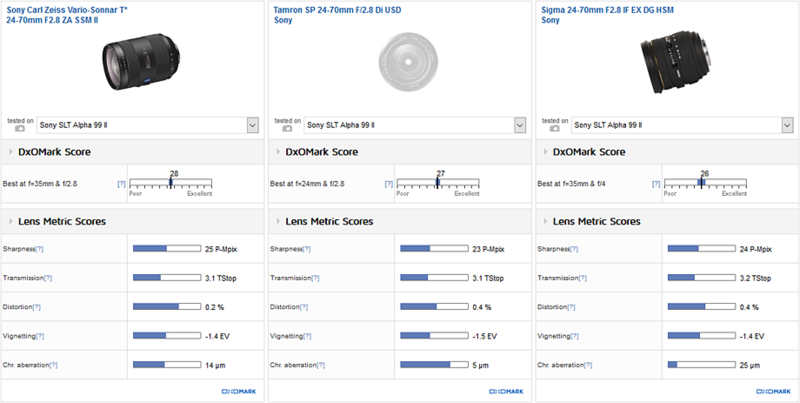 To simplify the analysis, we supply the results of the top performers in each of four categories: wide-angle, standard, telephoto, and as well as super zoom. Wide-angle zoom lenses offer a range of focal lengths from an ultra-wide through to a standard-wide field of view, making them a popular choice for landscape or architectural photography. They are also popular lenses with many news and press photographers who use full-frame DSLRs. We’ve tested both the Mark I and II versions of Sony’s own 16-35mm, which features a fixed f/2.8 aperture and SSM autofocus motor. With the Mark I now discontinued, the updated $2228 Sony 16-35mm f/2.8 ZA SSM II offers the same basic specifications and very similar lens metrics scores, but with a notable improvement in sharpness. The new Mark II lens offers excellent center sharpness at all focal lengths using apertures between f/2.8 and f/11. There’s a bit of edge softness at the wider f/2.8 and f/4 apertures, and particularly heavy at 35mm f/2.8; the Sony 16-35mm f/2.8 ZA SSM II hits peak sharpness at 35mm f/8, where it offers outstanding resolution of over 80% acutance and the most uniform sharpness. 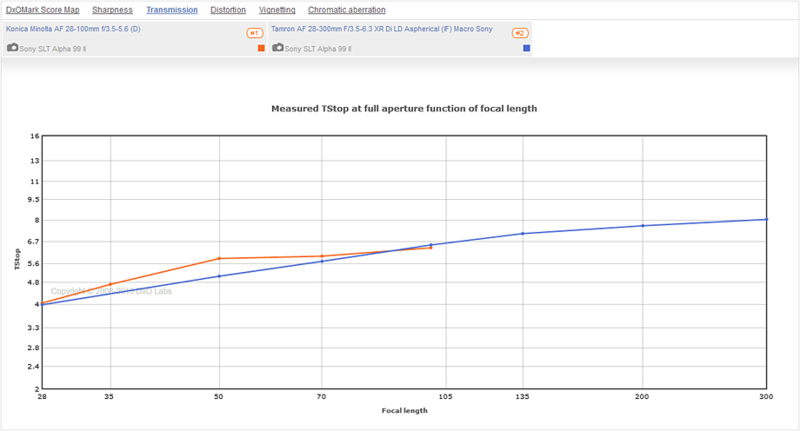 Some noticeable chromatic aberration occurs between 16mm and 24mm at all focal lengths, and it’s notably heavy (and would benefit from correction in post-production) at focal lengths between 16mm and 20mm with apertures between f/2.8 and f/5.6. From 16 to 24mm, there’s some fairly heavy vignetting between f/2.8 and f/5.6, and although it’s notably better using longer focal lengths and smaller apertures, some mild corner shading occurs at these settings, too. Standard zoom lenses offer a wide-angle through to short-telephoto focal length in a single lens, which makes them a convenient choice for a range of uses. On full-frame DSLRs, the standard zoom focal range is typically 24-70mm, with the pro-grade version featuring a fixed f/2.8 maximum aperture for shooting high-quality images even in poor lighting conditions. We’ve tested a total of six standard zoom lenses on the A99 II, with scores ranging from a high of 29 points on the Sony Vario-Sonnar T* 24-70mm ZA SSM to a low of 23 points on the Konica Minolta AF 28-75mm f/2.8 (D). The top three performers include the updated $2098 Sony Vario-Sonnar T* 24-70mm ZA SSM II, which replaces the now-discontinued Mark I version; the $1099 third-party Tamron SP 24-70mm f/2.8 Di USD, and the $699 Sigma 24-70mm f/2.8 IF EX DG HSM. All three feature similar specifications, including high-grade autofocus motors, and all achieve similar overall scores, thanks to their excellent low-light performance and light transmission. 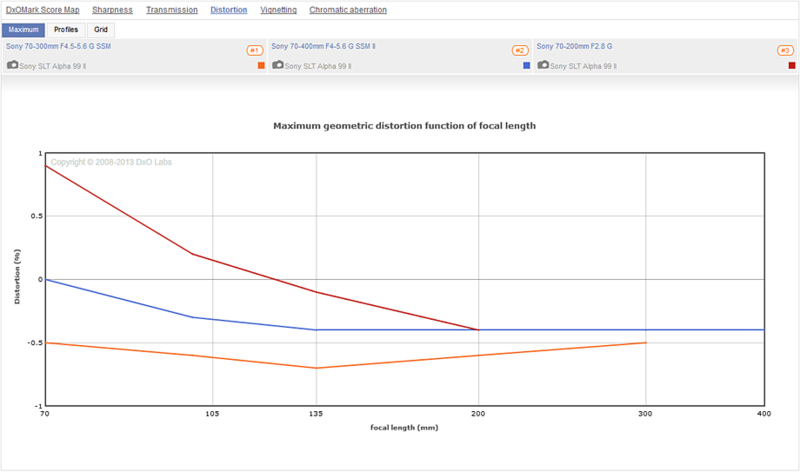 Sharpness is pretty close among these three lenses, too, with Sony’s own 24-70mm just edging it, thanks to slightly more consistent resolution overall. The Sony lens boasts high levels of center resolution at all focal lengths using apertures between f/2.8 and f/11, as well as the best results at 70mm f/2.8. The Sigma and Tamron versions continue to offer very good resolution, despite slightly reduced sharpness at 70mm f/2.8 — an important setting on a lens of this type. The Sigma displays a little edge softness at f/2.8 using all focal lengths, but hits peak sharpness at f/5.6 between 24-50mm, where it boasts the highest resolution of these three lenses. The Tamron 24-70mm offers the best results for chromatic aberration, however, which isn’t really an issue at any setting. 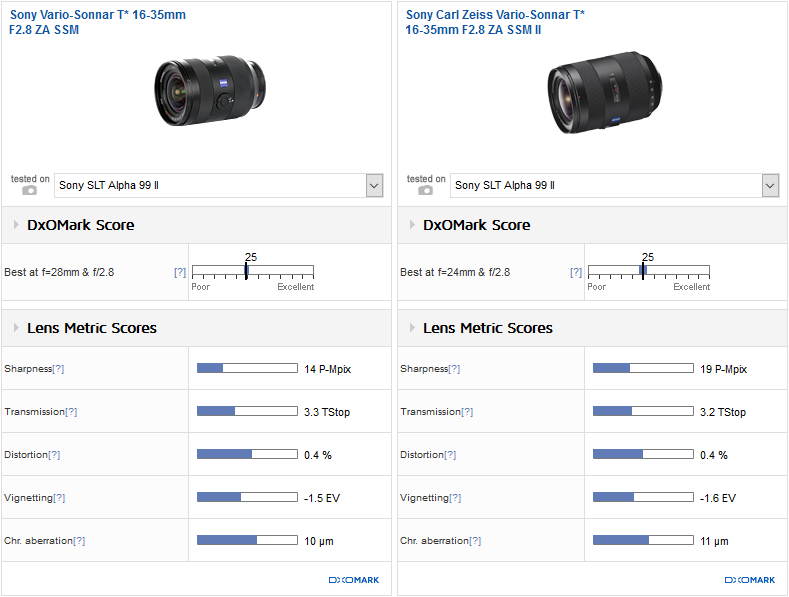 In comparison, both the Sony and Sigma lenses displays some fairly heavy fringing towards the corners of the frame using all apertures between 24mm and 35mm; and while the Sony improves at the longer focal lengths, it remains something of an issue on the Sigma at all focal lengths. 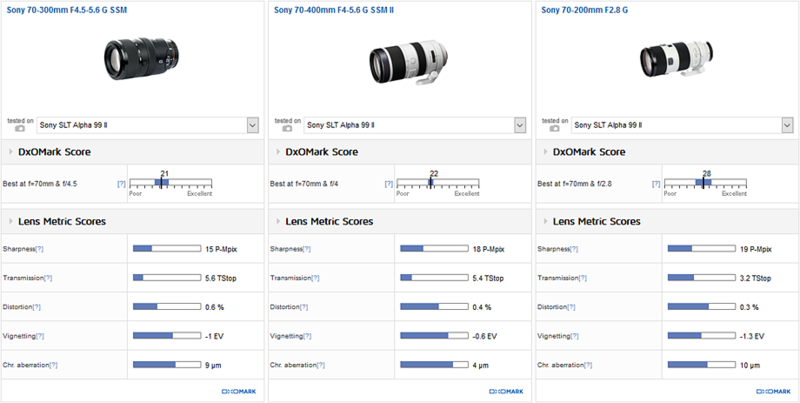 All three standard zooms also vignette a little at the wider apertures up to f/5.6, where they would benefit from some lens correction in post-production, but the Sony improves quicker at the longer focal lengths. A telephoto zoom enables photographers to capture distant subjects in sports, wildlife, events, and press shots. A fixed fast f/2.8 aperture also helps significantly for low-light shooting on a telephoto zoom, allowing photographers to achieve faster shutter speeds when shooting action shots or at low-light events, as well as to capture successful portraits with nice blurred backgrounds. We’ve tested four telephoto zooms on the A99 II, with scores ranging from a high of 28 points on the Sony 70-200mm f/2.8 G, to a low of 18 points on the Sigma 150-500mm f/5-6.3 APO DG OS HSM. The top three performers all offer slightly different specifications at different price points. Sony’s $2598 70-200mm f/2.8 G is the only typical full-frame telephoto zoom focal length with a fixed f/2.8 aperture that we’ve tested, and of course it ranks in first place, thanks to its large maximum aperture and excellent low-light performance. The slightly cheaper ($2198) Sony 70-400mm f/4-5.6 G SSM II allows you to get even closer to the action with its longer 400mm focal reach, but the tradeoff is a slower variable f/4-5.6 maximum aperture. The value option is the Sony 70-300mm f/4.5-5.6 G SSM, and although we’ve tested the Mark I version, the new Mark II version is available now for around $1048. If you need even greater reach on the A99 II, you should be able to pick up Sigma’s now-discontinued Sony-mount 150-500mm f/5-6.3 APO DG OS HSM on the secondhand market. Despite ranking 4th overall due to its lower light transmission and low-light performance, using good techniques, you can still get good results with it on the A99 II. The more expensive Sony 70-200mm f/2.8 G is far ahead of the other versions overall, however, thanks to its better low-light performance and light transmission. The 70-200mm f/2.8 G offers the best overall sharpness, too, although the cheaper, longer focal length options are pretty close, offering some good center sharpness at many settings. In fact, the 70-400mm offers excellent center resolution at most focal lengths up to f/16, with slightly better results at the longest focal length and maximum aperture compared to the competition. Using the maximum f/2.8 aperture, Sony’s 70-200mm offers excellent and uniform resolution at 70mm, but displays slightly softer edges between 100mm and 200mm. It has lower levels of overall resolution at 200mm f/2.8, which is disappointing, as this is an important setting on a lens of this type. Both variable-aperture versions offer excellent sharpness wide-open at 70mm, too; and in fact, the 70-400mm offers good resolution at the maximum aperture at all focal lengths, which is great for those photographers who want extra focal reach on the A99 II. The Sony 70-200mm f/2.8 G also displays some noticeable corner shading at its wider f/2.8 and f/4 apertures using all focal lengths. Again, the 70-400mm version excels, with the least vignetting at the longest focal length using the maximum aperture. The 70-400mm also offers the least distortion of the three telephoto zooms. The 70-200mm lens displays some barrelling at 70mm and some pincushion between 100-200mm; and pincushion distortion is also evident on the 70-300mm at all focal lengths. Chromatic aberration isn’t really an issue for any of these lenses. Super-zooms offer a wide-angle through to long-telephoto zoom range, making them a convenient all-in-one solution for a variety of uses, minus the hassle of changing lenses. The options are limited for Sony full-frame DSLRs, but we’ve tested a couple of options — the $369 Tamron AF 28-300mm f/3.5-5.6 XR Di LD, and the now-discontinued Konica Minolta AF 28-100mm f/3.5-6.5 (D) (not discussed in this review). At just $369, the Tamron 28-300mm is a budget all-in-one solution for A99 II shooters; its inexpensiveness is reflected in a lower overall score that was affected by the variable maximum aperture, which reduces to f/6.3 when fully zoomed in. As a result, you’re going to need some pretty decent light to get the best performance out of the Tamron 28-300mm when shooting between 70mm and 300mm. For sharpness, the Tamron 28-300mm also offers its best results at the shorter 28-70mm focal lengths using apertures between f/5.6 and f/11. It hits peak sharpness at 50mm f/8 and 70mm f/11, where it boasts good uniform resolution, but it records poor edge resolution using the maximum aperture at the long end of the focal range. The Tamron 28-300mm also displays some noticeable vignetting using the maximum apertures at all focal lengths, as well as some barrel distortion over 0.5% at 28mm and pincushion over –0.5% between 50 and 300mm.